Azure blue seas, powdery white-sand beaches, and a sunny Mediterranean landscape set the stage for a dream vacation. Spain's Balearic Islands include four gorgeous islands each with its own special character. Mallorca has glorious churches, ancient villages, and inspiring monasteries as well as pristine sandy shores. Smaller and more laid-back, Menorca offers a quiet escape for those who love the seaside, nature, and country ambience. Ibiza Island is famous for its lively ambience and beautiful beaches but also has culture in its UNESCO-listed Old Town, one of the most picturesque sites in Spain. For those who appreciate relatively undiscovered destinations, Formentera Island offers sheltered coves with secluded beaches and a UNESCO-listed maritime natural park that protects more than 10,000 hectares of land and sea. One of the prettiest villages in Spain, the UNESCO-listed Dalt Vila is the Old Town of Eivissa that was the original medieval walled city. Here, tourists can discover a dreamy Mediterranean scene of charming whitewashed houses cascading down to a vibrant waterfront. This quaint little medieval world is perched on a hilltop above the rest of the town, surrounded by massive fortifications. The ramparts were built in the 16th century on top of the remains of the Moorish walls, with three gates and seven corner bastions. The main entrance gate is the Puerta de las Tablas featuring the coat of arms of King Philip II, and the gatehouse now houses the Museum of Contemporary Art. Inside the ancient walls, the Dalt Vila is a quaint labyrinth of narrow cobblestone streets, winding pedestrian lanes, and grand historic houses. Soaring above all the other monuments is the Old Town's crowning glory, the Catedral de Nuestra Señora de las Nieves (Cathedral of Our Lady of the Snows). The cathedral was built in the 13th and 14th centuries on the site of the Yebisah Mosque dating to the era of Islamic rule. Originally the cathedral was Gothic but was renovated in the 18th century in Baroque style. Visitors are impressed by the austere and imposing exterior with its prominent flying buttresses. From the terrace on the south side of the cathedral, tourists can take in the magnificent views of the bay. A lovely seaside capital city, Palma de Mallorca offers beautiful beaches along with historical and cultural attractions. This elegant city lies on the Bay of Mallorca and is blessed with mild, sunny weather year-round. Presiding over the Old Harbor, the cathedral creates a magnificent impression from across the bay with its spires and towers soaring high above town. Another top tourist attraction is the Almudaina Palace, originally a Moorish fortress that was converted to a royal residence for the Catholic Monarchs in the 14th century. The bustling Lonja Fish Market at the scenic harbor and the Plaza Mayor, the town's main square, are also worth visiting. After seeing the sights, many tourists head to the beach. 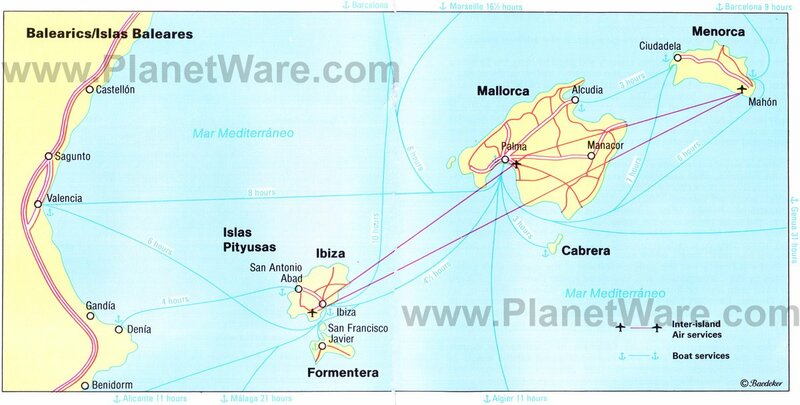 Palma de Mallorca offers several excellent beaches including Cala Major, near the Miró Museum; the Playa de Palma, a popular beach 10 kilometers from the city; and adjoined to Playa de Palma, the Playa del Arenal, an expansive beach with a yacht club. Less touristy than Ibiza and Mallorca, the idyllic island of Formentera offers a peaceful escape to nature. The rugged and unspoiled coastline is punctuated by dramatic cliffs that descend to fine beaches. Many of the beaches enjoy a secluded and well-protected environment, perfect for relaxation. Found in a quiet bay, Pujols Beach has a wide shoreline of fine white sand and tranquil waters ideal for bathing and watersports. This beach also has a promenade where people stroll during the day as well as in the evenings. Near the towns of Sant Francesc de Formentera and La Savina are two fantastic beaches: Llevant Beach is a lively scene of sunbathers, restaurants, and watersports enthusiasts. Illetes Beach is set in a lovely location with stunning views across the sea to the Island of Ibiza. Other tiny offshore islands are close enough to be reached by swimming. Adding to the charm, the area around this beach has not been overdeveloped, which allows for a sense of peacefulness. This fortified medieval town offers the charm of Old World Europe. Enclosed within the ancient defense walls, Alcúdia's historic quarter is a delightful world of cobblestone pedestrian streets and quaint historical buildings. While strolling through the town, visitors will notice many beautiful churches as well as old aristocratic houses with coats of arms and Renaissance windows. Alcúdia also has many inviting restaurants and cafés with pleasant outdoor terraces. 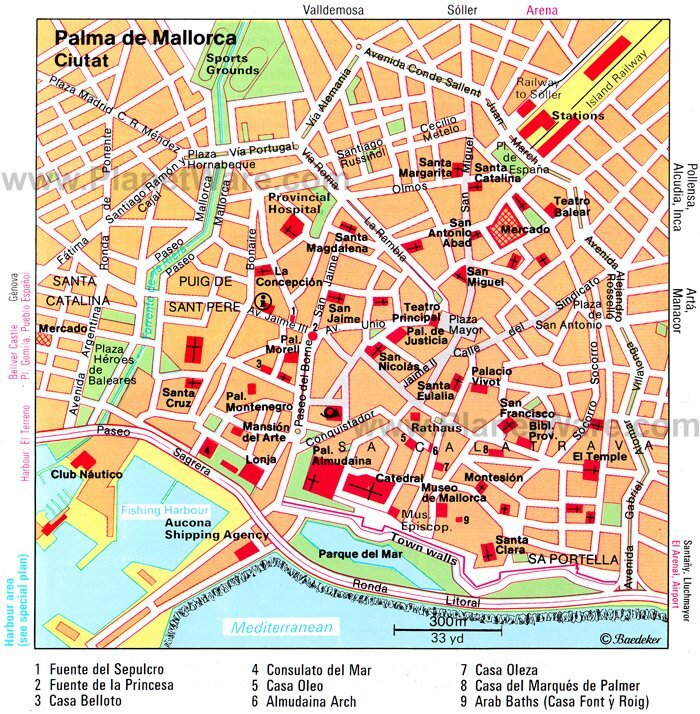 Another interesting attraction near Sant Jaume Church is the archaeological site that represents the Roman city of Pollèntia dating from the second century BC. The site has the remains of ancient Roman houses, a theater, and a forum. The Pollentia Museum displays artifacts that were uncovered at nearby archaeological excavations. Alcudia is renowned for its traditional festivals and cultural events, such as classical music concerts. On Tuesdays and Sundays, the town hosts a farmers market where fresh produce from the local countryside is sold. The rural area around Alcudia is a delightful place for tourists to explore by bicycle or car. Valldemossa is a picture-perfect village perched on a hilltop of the Tramuntana Mountains overlooking the Mediterranean Sea. This quiet country town is surrounded by wooded hills, orchards, and olive groves. Visitors enjoy strolling the narrow cobblestone lanes and admiring lovely old stone buildings decorated with potted plants. 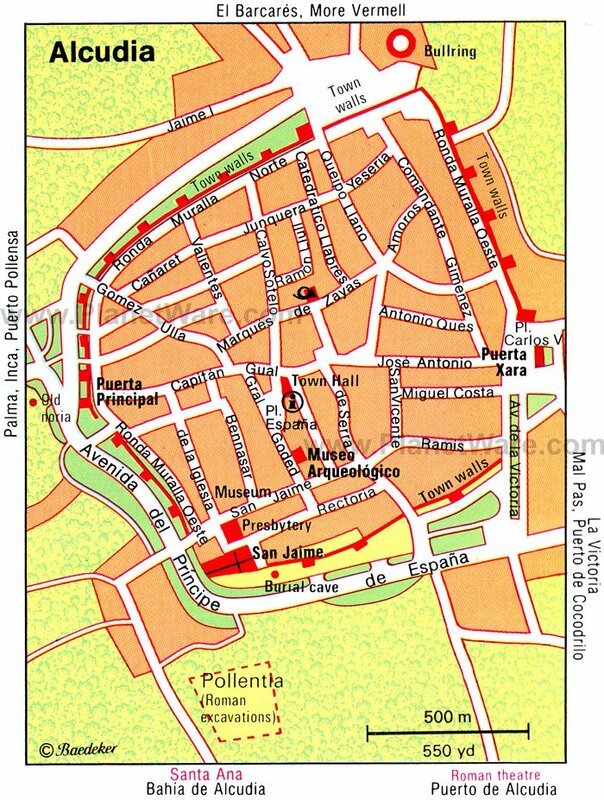 Many of the charming pedestrian streets are lined with cafés, boutiques, and art galleries. 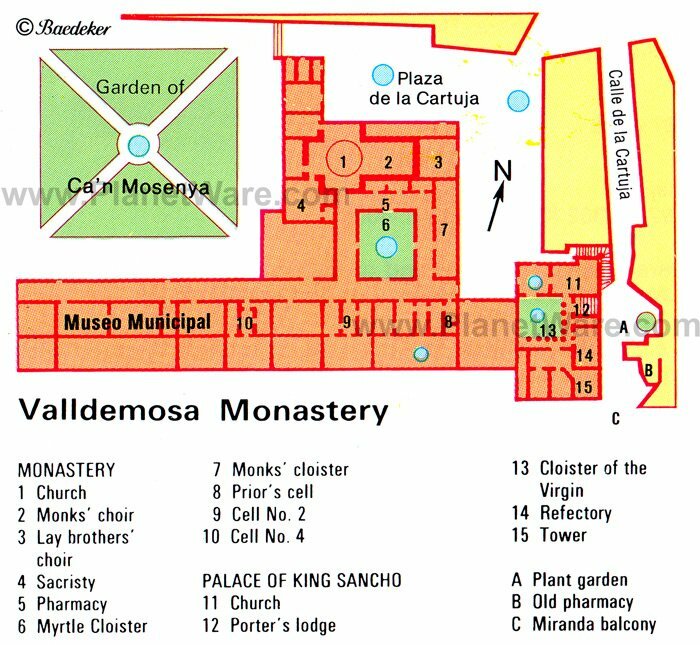 The must-see sight of Valldemossa is the Real Cartuja de Valldemossa, a medieval Carthusian Monastery that was originally built as a royal residence in the 14th century. The famous composer Chopin rented a room here with novelist Aurore Dupin (George Sand) during the winter of 1838-1839; they both were inspired artistically by the beauty of the monastery and its serene natural setting. Also part of the municipality is the Port of Valldemossa, an old fishing village with a lovely harbor. This area is known for its superb cuisine. Locally caught fish is combined with fresh produce from the surrounding farms, creating tantalizing dishes. Listed as a UNESCO-World Heritage Site, the Natural Park of Ses Salines is a maritime nature reserve that encompasses the area of southern Ibiza Island and northern Formentera Island as well as the sea channel in between the two islands. The majority (75%) of the natural park covers water and represents 9,000 hectares of the park compared with 2,838 hectares of land. An interesting feature is the expanse of underwater meadows with aquatic plants that are only found in the Mediterranean. These underwater environments allow a diversity of fish and other organisms to flourish. The other aspect of the park is the land covered with Mediterranean shrubs, coastal pine trees, and rare cliff vegetation. Birdwatchers will be delighted by the sightings, with more than 200 different species of birds making their home in this park. Flamingos, black-winged stilt, Audouin's gull, and the Balearic shearwater can be spotted here. Other animal life is also found in abundance, such as lizards, unique native species of snails, and beetles. Mahón stands dramatically on a cliff's edge at the eastern end of Menorca Island. The town was founded here for strategic purposes, because it has an excellent natural harbor and a protected location sheltered from wind and inclement weather. Visitors arriving by sea will be delighted by the scenery as the boat makes its way past old forts, islands, and coves toward the harbor. Mahón is a laid-back town with a slow pace that families with kids will appreciate. Enjoy a leisurely walk through the old streets while taking in the sea views. Be sure to stop at the Plaza de España, a spacious town square where a traditional market is held under the arcades of a former Carmelite priory. Gracing the square is the Iglesia del Carmen, an impressive Neoclassical church built in the 18th century. For the best views of the harbor, head to the Plaza Miranda by taking a narrow stepped lane from the Rampa. In the beginning of September, the town has a lively religious fiesta honoring the Virgen de Gracia, with traditional processions, marching bands, and colorful celebrations. 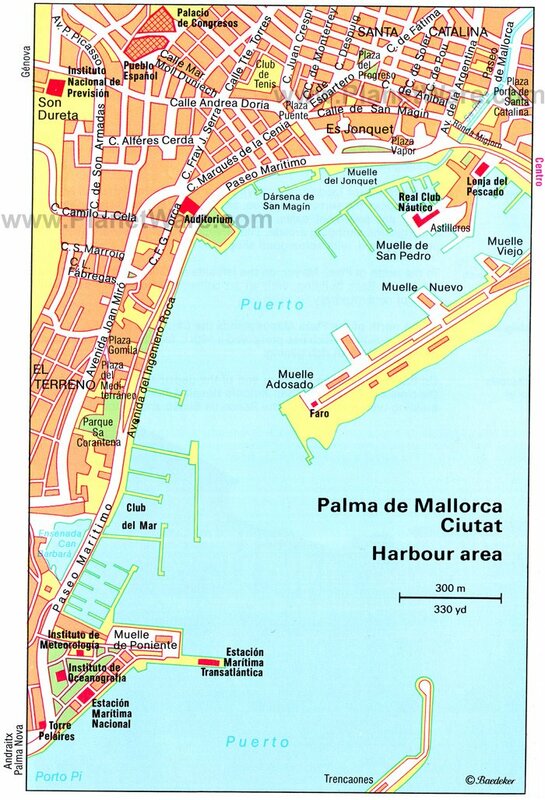 Puerto Portals is the place to see and be seen in Mallorca. This glamorous seaside resort appeals to a chic clientele who appreciate flashy cars, fancy yachts, fashionable dining, and upscale shopping. Drawing an international crowd of stylish visitors, Puerto Portals has the feel of Monte Carlo in Monaco. Along the picturesque marina, visitors will find a yacht club and many stylish restaurants. The most famous dining establishment is the Michelin starred Tristan restaurant. Other options include the Ritzi Restaurant with its pleasant outdoor terrace and Cappuccino Bistro that overlooks the yacht marina. On the northern tip of Ibiza Island, the Cala Portinatx is a popular resort area with wonderful beaches, excellent sailing opportunities, and surfing schools. The pristine beaches and ideal weather draw sunbathers during summertime. Gentle waters make swimming safe; and lifeguards also survey the scene during high season. Snorkelers and scuba divers prize the crystal-clear waters. The Cala Portinatx bay is sheltered from the open sea by a rock barrier, which protects against tidal action and ensures gentle waves. This rare prehistoric site is five kilometers west of Mahón in a rural landscape of stunning beauty. The megalithic monument, Talatí de Dalt, is a chamber topped with a thick stone slab supported by a central monolith. Built in the Bronze Age (around 1300 BC) the Talatí de Dalt represents an architectural structure from one of the most important prehistoric settlements on the Island of Menorca.